As the saying goes, two things are certain in life: death and taxes. Around tax time, it’s a toss up as to which of the two people dread more. I used to rush around in early April, trying to collect documents in the hopes that I wouldn’t have to file an extension. When I began working at start-up companies I was issued stock, and my taxes got way more complicated. Reporting stock ownership and income is fairly complicated when the stock is in a privately held company. I decided that it was too risky not to get this whole tax thing down to a science. 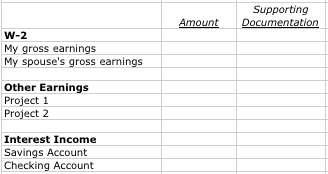 So I’ve developed a simple system that makes tax time a breeze for me – even with some fairly complicated reporting. I have dubbed it the 3 Folder Tax System. I share it here in the hopes that it will make tax time a little easier for you. You’ll also need to schedule an annual Tax Review, which is really just a session to collect and file all of your tax documents. Every year I create a new tag in my Gmail inbox for that tax year, labeled “Taxes 20XX”. Any time I get an email communication that has tax implications, say a receipt for a charitable contribution, I simply label it with that tag. This keeps me from having to hunt through my emails at tax time trying to remember what confirmations I might have, somewhere in my archives. 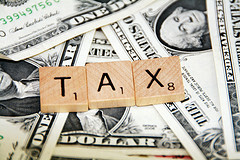 Unfortunately, not all organizations make your documents with tax implications available to you online. Boo. 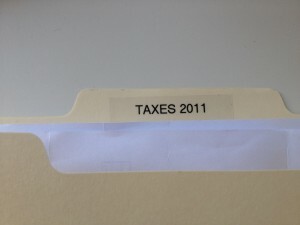 Therefore, I keep a simple manila folder for each tax year labeled “Taxes 20XX”. When I get a paper statement from a charity, or an end-of-year interest income statement from a bank, I simply drop it in to that manila folder. 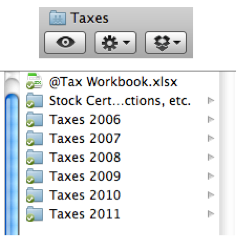 I keep a folder in my Dropbox labeled “Taxes”. In that folder are sub-folders labeled for each year “Taxes 20XX”. These folders are the final repository for all of my tax documents. Everything ends up here once I have completed my Tax Review. I schedule a review, usually in mid February, before I send all of my documents to my tax advisor (who files my taxes electronically for me). Collect all the email correspondences from my “Taxes 20XX” Gmail tag, save them as PDF and store them in my “Taxes 20XX” Dropbox folder. Scan any paper documents that can’t be found online and store them digitally in my “Taxes 20XX” Dropbox folder (This may require a trip to Kinkos). I now have all of the necessary paperwork for my taxes and probably could stop there. But I also like to keep a high level view of the year in my Tax Workbook. It’s a simple Excel document with a tab for each tax year. Keeping this notebook also serves as a double-check to make sure that I’ve gone to all the appropriate sources to collect my back up information. After your taxes are filed be sure to get an electronic copy of your taxes and put it in the appropriate “Taxes 20XX” Dropbox folder. Taxes made easy. Baby, Baby! You likey? Leave a comment. Having just gone through the annual tax review this week in preparation for a call with our accountant this hits very close to home. I like the practical style of the post. Reminds me of a past favorite of mine about getting things done on 28 and Change. I will oddly plug an app I rely on for scanning called Genius Scan. Maybe that’s lame to do but it’s like having a scanner in your pocket that lets you save straight to dropbox. Great tips man. I’ve been doing similar things with my taxes. I need to get a scanner at home, I just hate paper lying around all over the place. Thanks Gary! A lot people like this one: http://amzn.to/64pQnE.